My Camera is a hands-free application for taking photographs and videos. 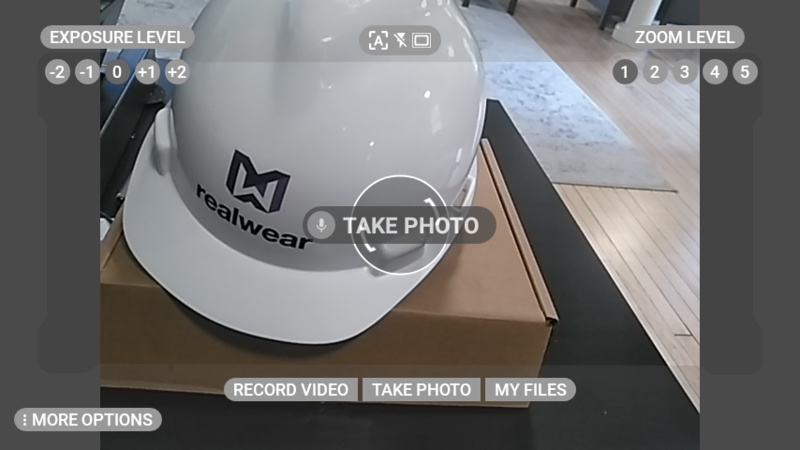 From the Home Screen or from the My Programs screen, say “MY CAMERA” to launch the My Camera application. 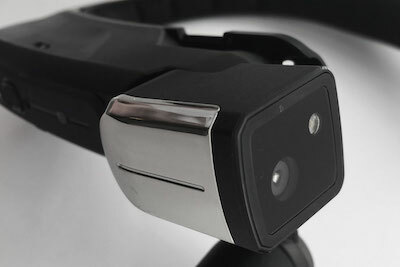 When My Camera is launched, a live view of the HMT camera’s optical input will be visible in the HMT display pod. 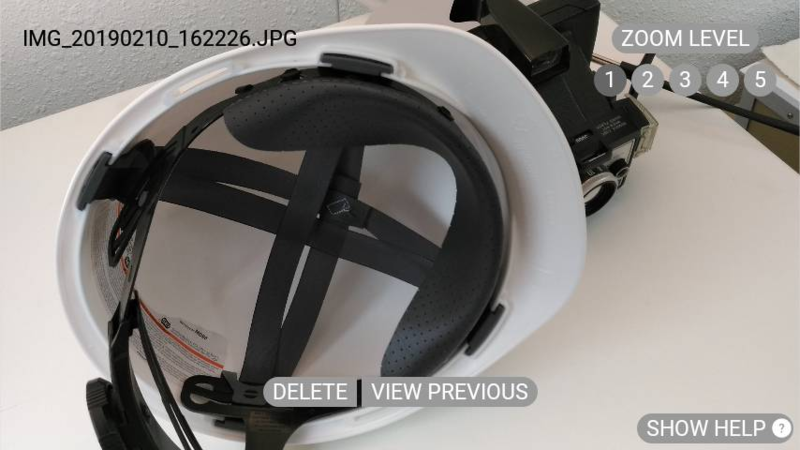 The Camera head-up display provides a full range of camera control and settings. 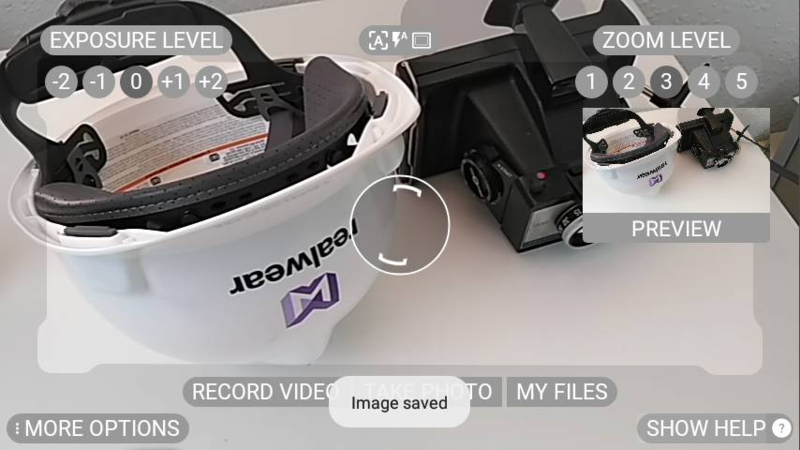 Start capturing video by saying “RECORD VIDEO”. 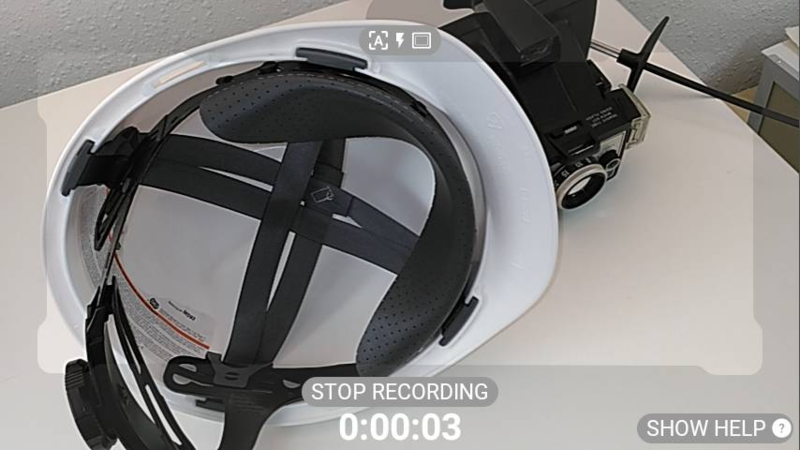 Say “STOP RECORDING” to stop recording video. Take a photo by saying “TAKE PHOTO”. 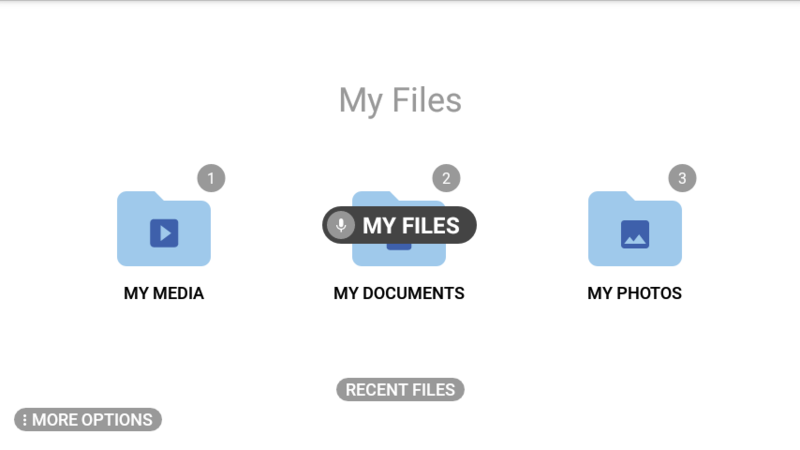 Say “MY FILES” to access stored files on the device. 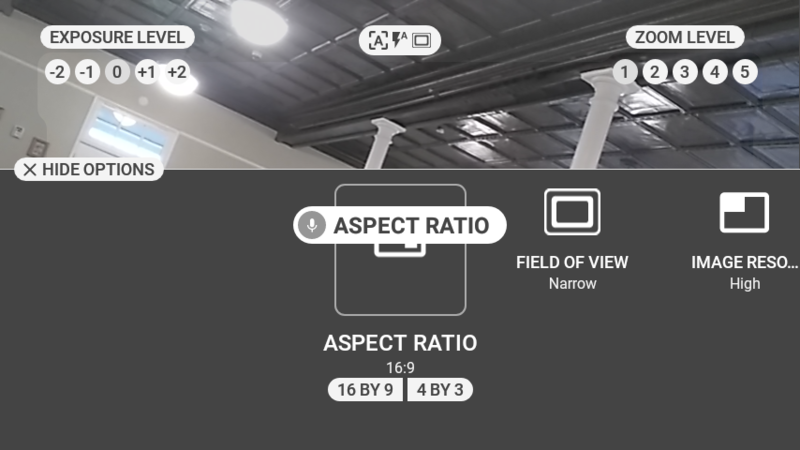 When a video or photo is captured, a preview will be displayed in the mid to upper right corner of the view. Open it by saying ‘PREVIEW’ while the preview pane is displayed. As in other applications that use the Camera, say “ZOOM LEVEL #” to adjust it as you go. 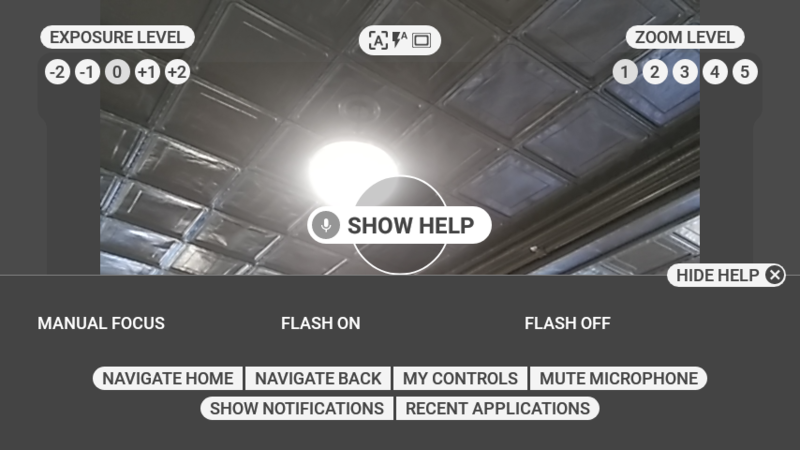 Saying “MORE OPTIONS” displays more camera settings that are useful for fine adjustments and device adaptation. 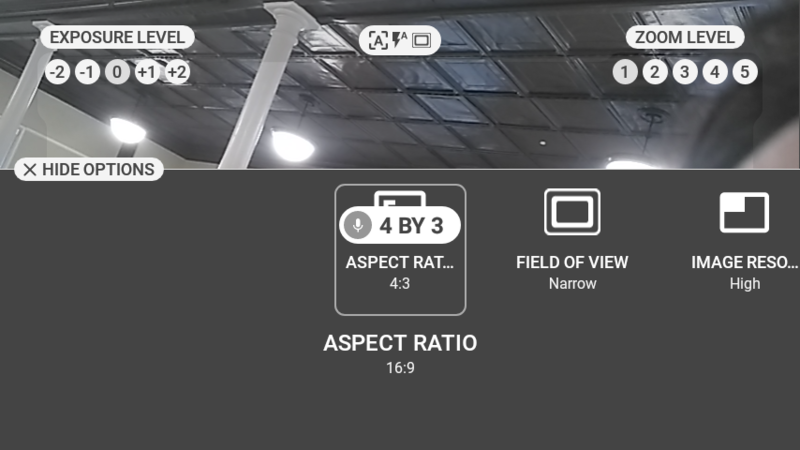 Saying “ASPECT RATIO” allows you to toggle between the two capture aspect ratio settings. Say “SIXTEEN BY NINE” or “FOUR BY THREE” to change the setting. 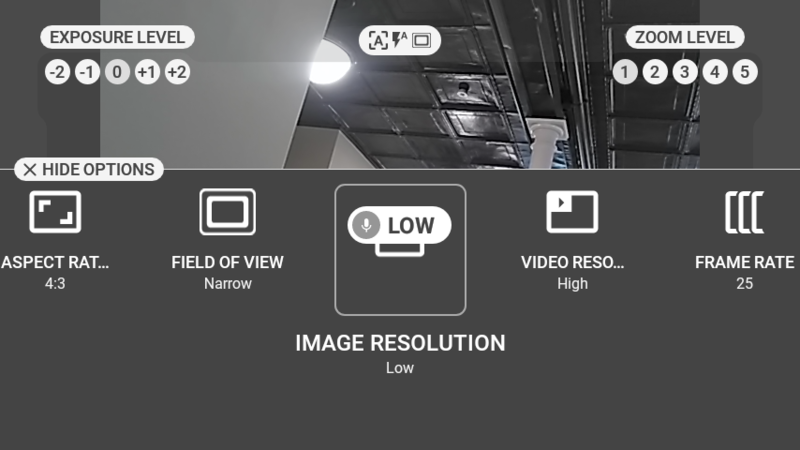 Saying “FIELD OF VIEW” toggles between narrow and wide field of view. 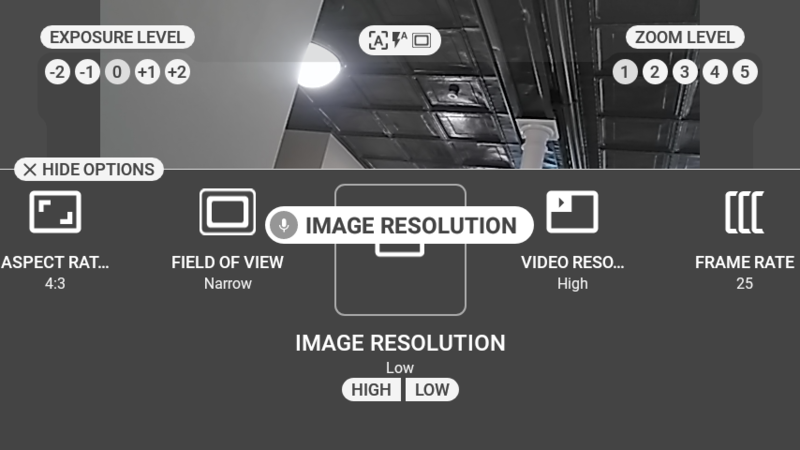 Saying “IMAGE RESOLUTION” allows you to toggle between image resolution options. Say “HIGH” or “LOW” to switch modes. 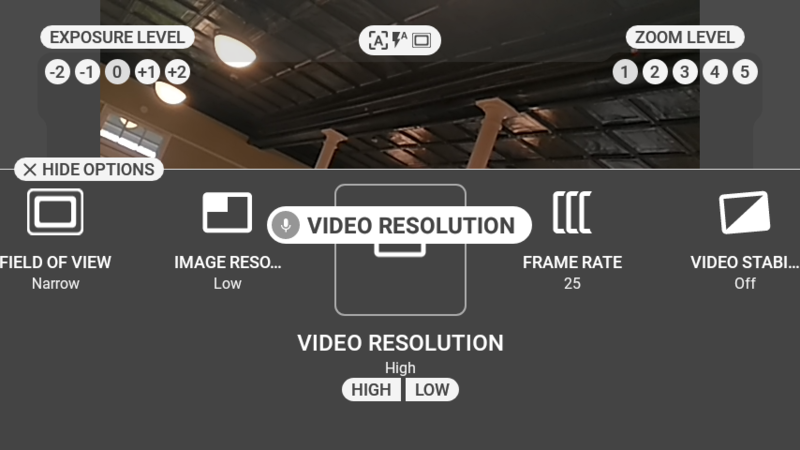 Saying “VIDEO RESOLUTION” allows you to toggle between video resolution options. 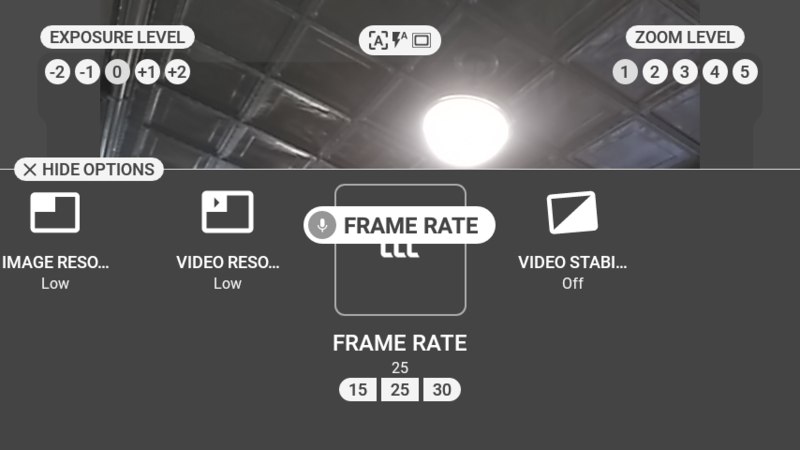 Saying “FRAME RATE” allows you to toggle the frame rate at which video will be captured. Say “FIFTEEN”, “TWENTY FIVE” or “THIRTY” to select the desired frame rate. 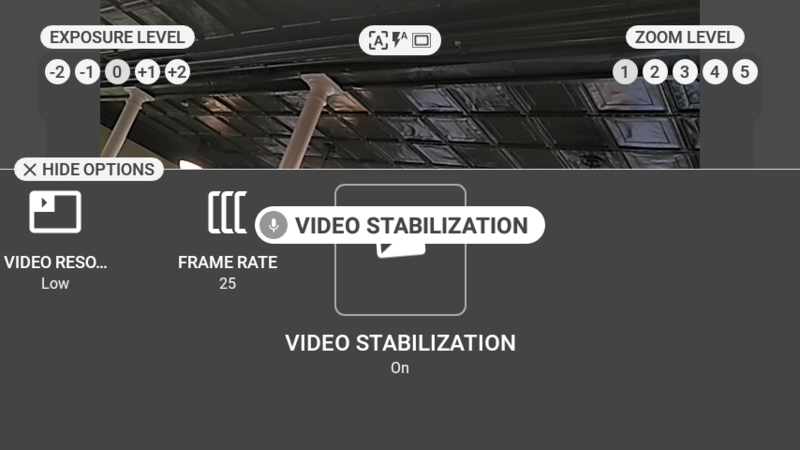 Saying “VIDEO STABILIZATION” will toggle on or off the built-in video stabilization function. 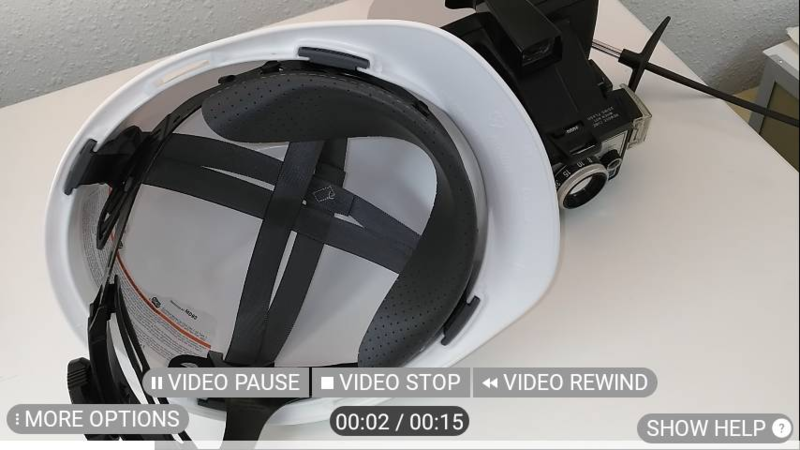 When enabled, this provides a smoother video compensation for movement. 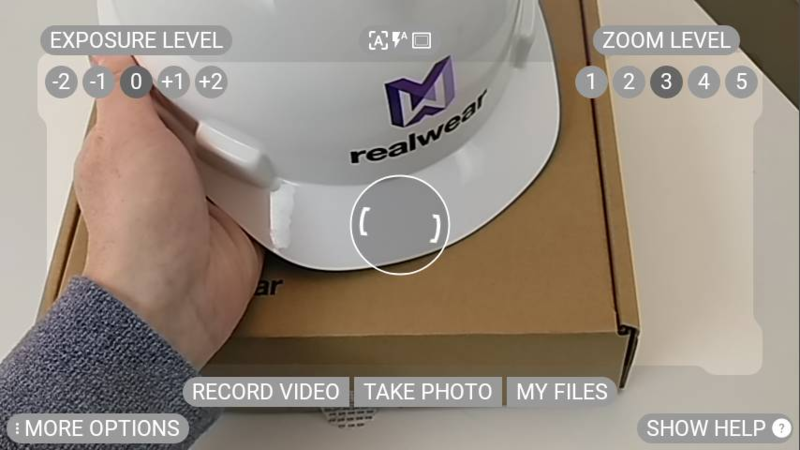 Additional Camera commands can be referenced by opening the Help panel. Saying “MANUAL FOCUS” toggles on Manual Focus. 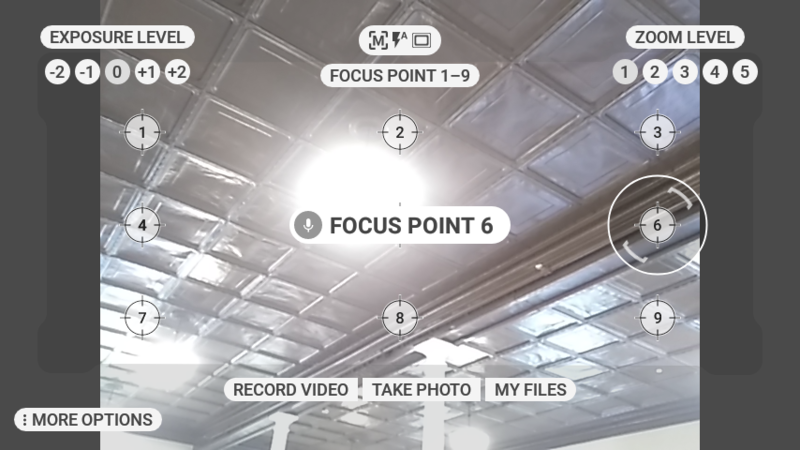 Once enabled, you can set a focus point by saying “FOCUS POINT ONE”…”FOCUS POINT NINE”. For instance, to focus on point 6, say “FOCUS POINT SIX”. Say “AUTO FOCUS” to return to the Auto-focus function. The default flash setting is off. Flash commands can be found in the SHOW HELP menu. To turn on the Flash on say “FLASH ON”. To turn off say “FLASH OFF”. “RECORD VIDEO” Starts recording video. 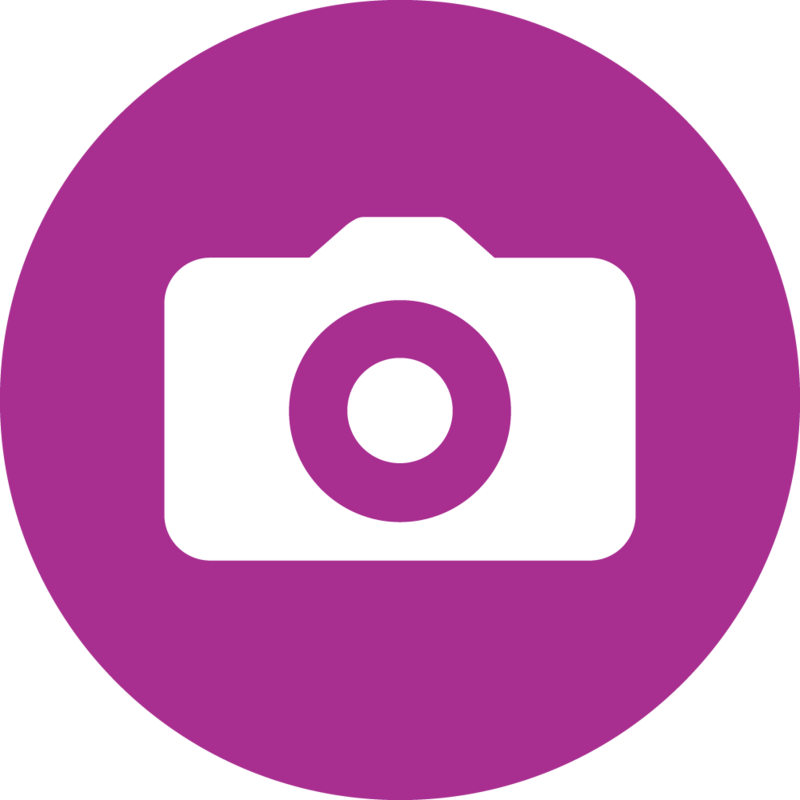 “TAKE PHOTO” Captures a photo. “MY FILES” Opens my files. “PREVIEW” While preview thumbnail is visible, will open last captured photo or video. 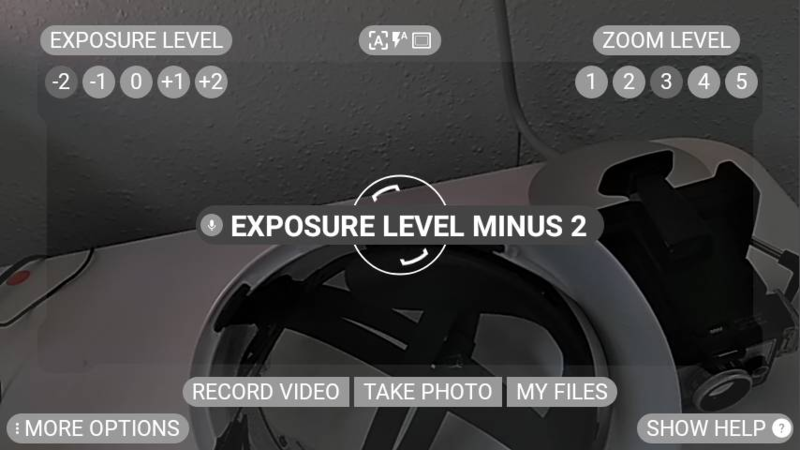 “EXPOSURE LEVEL PLUS ONE”, “EXPOSURE LEVEL PLUS TWO” Adjusts exposure level. 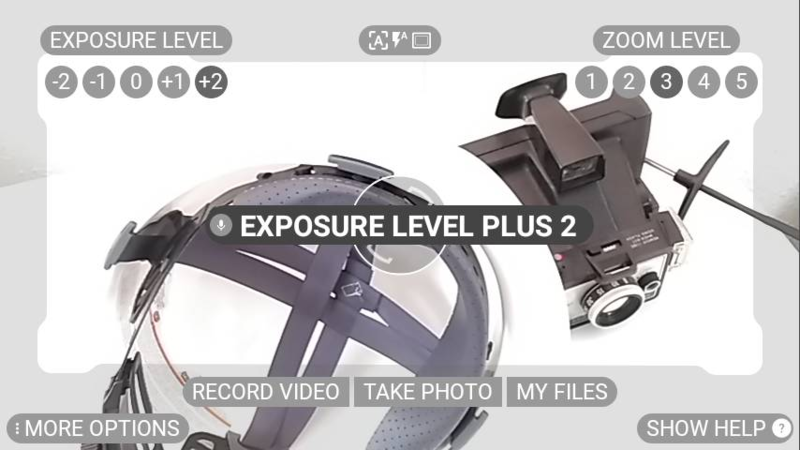 The screen will immediately show the results of the exposure level change. Default is Exposure Level 0. 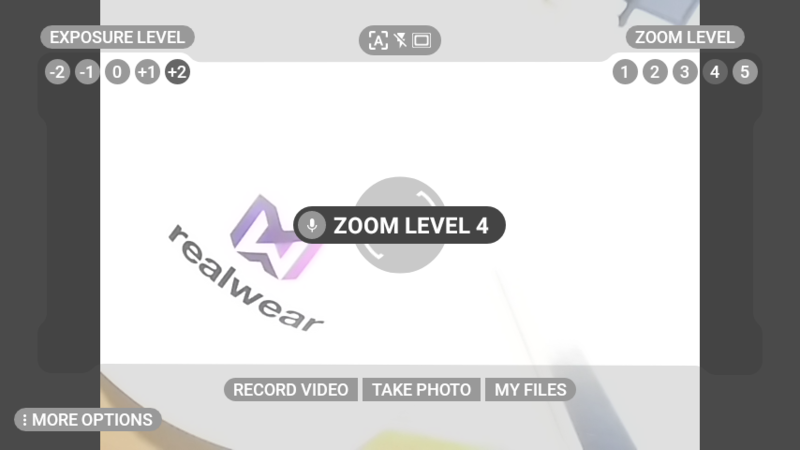 “ZOOM LEVEL ONE”, “ZOOM LEVEL TWO”, … , “ZOOM LEVEL FIVE” Adjusts zoom level. “MORE OPTIONS” Opens Camera Options panel. 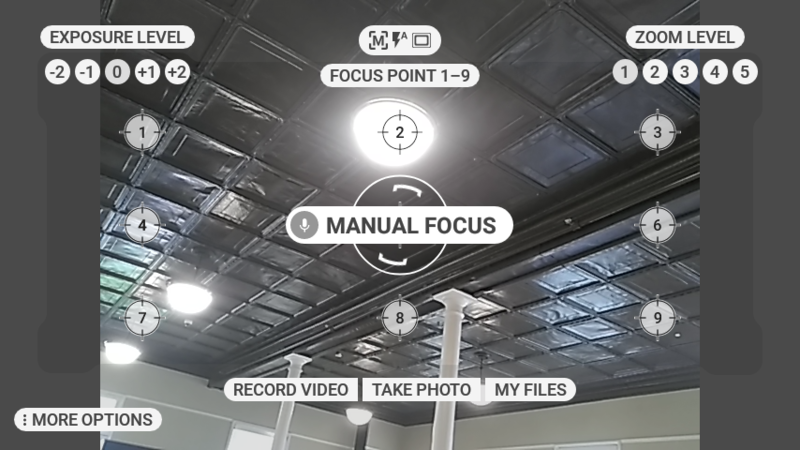 “MANUAL FOCUS” Switches focus mode to manual. “AUTO FOCUS” Switches focus mode to auto. “FLASH ON” Turns flash on. “FLASH OFF” Turns flash off. 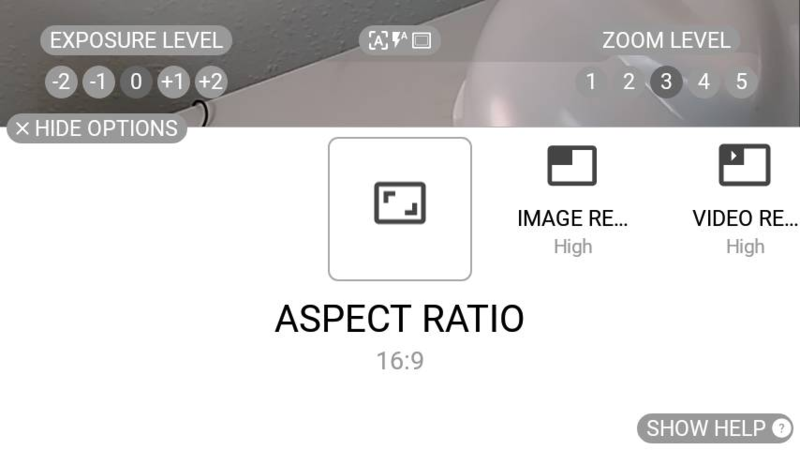 “ASPECT RATIO” Opens settings sub menu for Aspect Ratio. 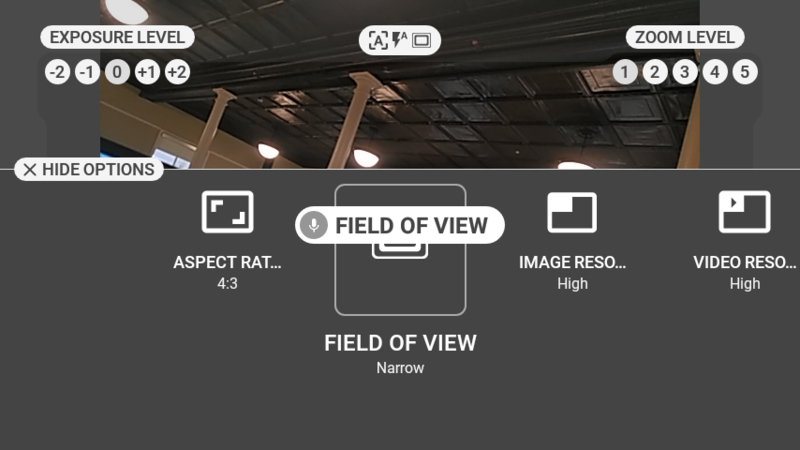 “FIELD OF VIEW” Opens settings sub menu for Field of View. “IMAGE RESOLUTION” Opens settings sub menu for Image Resolution. 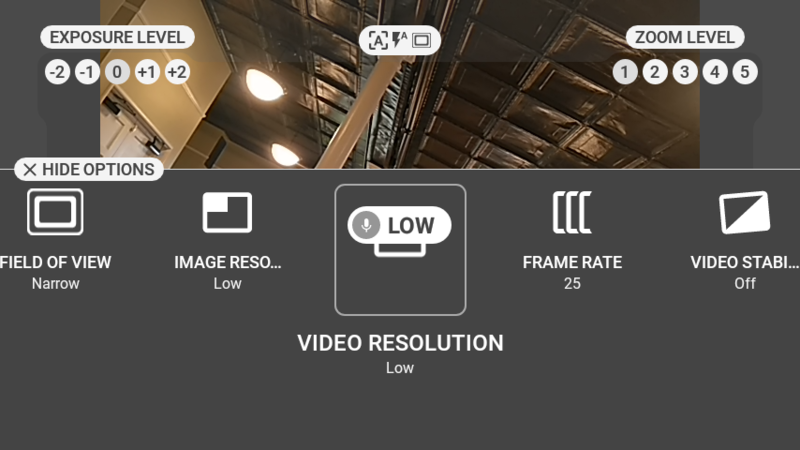 “VIDEO RESOLUTION” Opens settings sub menu for Video Resolution. 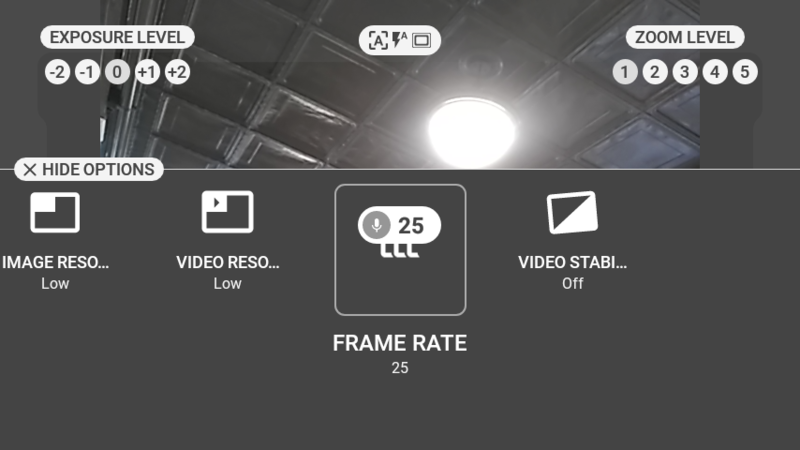 “FRAME RATE” Opens settings sub menu for Frame Rate. “VIDEO STABILIZATION” Opens settings sub menu for Video Stabilization.